With some .RAW files, the reader libraries will only work if you set your computer's regional setting to use the decimal point "." as the decimal separator. 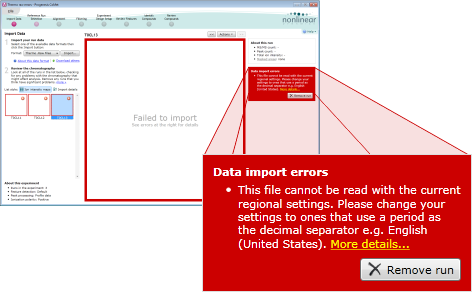 If you use the decimal comma (common in many European contries), then the files will not be read correctly and the import into Progenesis may fail with the above error. The easiest method is to then select an English regional setting, e.g. English (United Kingdom), English (Ireland), or English (United States).